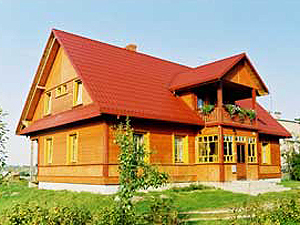 Wisniowy Sad agritourism farm house is situated on big allotment. It has a beautiful view of the panorama of the Bialowieza Forest. This big, wooden house includes spacious living room and kitchen on the ground floor and five rooms on the first floor. Near the house there is a hot tub with original brick oven. An open-air shed with the place for bonfire and barbecue is also to be found outside. Guests can order breakfasts. Bigger groups have the opportunity to order lunches or dinners. We offer homemade ham, fruit as well as vegetable preserves and the best regional cuisine. Bonfire place, barbecue and hot tube (steam bath) are at guests` disposal. We provide information about the tourist attractions available in the Bialowieza Forest and its surroundings. We also help with leisure time organization, for example: organising trips in Podlasie and the Bialowieza Forest region.